Gov. 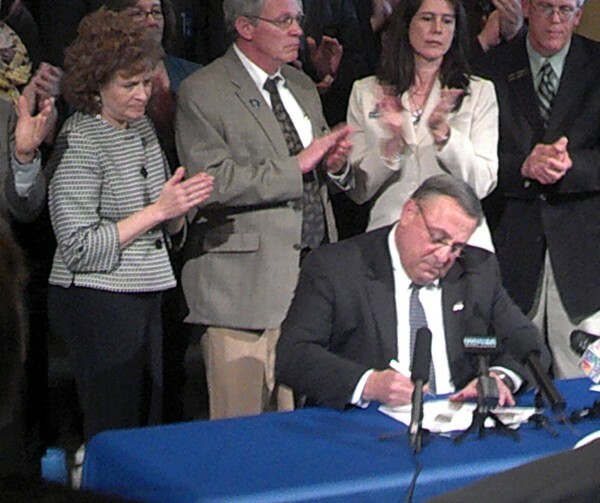 Paul LePage signs a veto letter he delivered to the Legislature after the Senate gave final passage to a bill that links repayment of Maine's hospital debt with an expansion of Medicaid in this May 23, 2013, file photo. AUGUSTA, Maine — Nearly as fast as Republican Gov. Paul LePage can sign veto letters, lawmakers are overturning them. It’s putting LePage on pace for another entry in Maine’s political record books: the most overturned governor in state history. The Maine House of Representatives overrode 11 of LePage’s vetoes Tuesday, and the House and Senate combined have overturned 14 vetoes this lawmaking session. Former independent Gov. James Longley holds the record for having more of his vetoes overturned than any other governor during a single term in office, according to Paul Mills, a Farmington attorney, author and political historian. Longley, who served from 1975 to 1979, saw 64 vetoes overridden. The Republican-controlled state Senate matched the House’s pace Wednesday, overriding nine vetoes in a blistering 20 minutes, without debate. An unofficial count Wednesday morning showed LePage vetoed at least 42 bills since the start of the 2015 lawmaking session. With an estimated 400 or more bills still in the legislative pipeline, the number of vetoes is expected to climb, given LePage’ recent promises to veto every bill hitting his desk with a Democratic sponsor on it. LePage said he’s vetoing bills authored by Democrats, even those agreed to unanimously — bills that “go under the hammer” — in the House and Senate, to punish lawmakers for not supporting his efforts to establish a ballot question seeking to eliminate the state’s income tax. Senate Republicans appeared to be standing with Democrats on the overrides with eight of 10 vetoes to Democratic bills being overturned on 35-0 votes. On Wednesday, LePage sent three more vetoes to the House, including two sponsored by Democratic lawmakers and one sponsored by Senate Majority Leader Garrett Mason, R-Lisbon. Assistant House Majority Leader Sara Gideon, D-Freeport, chastised LePage for blindly vetoing bills based on sponsorship and not over concerns or disagreement on policy. Gideon and House Majority Leader Jeff McCabe of Skowhegan touted the “bipartisan” way lawmakers seemed to be rejecting LePage’s stance, which many see as an arbitrary abuse of his powers. Beyond making a political statement against his Democratic rivals, LePage’s actions are having the effect of slowing down the legislative process as lawmakers face a looming adjournment date of June 17 and a budget stalemate. McCabe said the House took between two and three hours Tuesday just to override vetoes — time lawmakers could have used to finish other work left on committee tables. “It’s tiring, and you see the look on Republicans’ and Democrats’ faces when they have to take up these veto overrides for pure partisan reasons, and it is pretty disappointing,” McCabe said. While LePage may be attempting to drive a wedge between the respective caucuses on several key issues, his recent actions may be having the opposite effect, McCabe said. Senate President Mike Thibodeau, R-Winterport, was more forgiving of LePage’s actions Wednesday. Thibodeau said the Senate was taking the override votes in stride.